Technological breakthroughs have no doubt nurtured new opportunities for development. In recent years, we saw the integration of hardware, the internet, and cloud computing bring about phenomenal advances in the form of wearable devices, smart cities, smart transportation, unmanned systems, and much more. In the upcoming TechCrunch 2018 International Innovation Summit in Shenzhen, innovative leaders in the field of smart hardware and IoT will help us decrypt and decipher the genes embedded in today’s new technologies. Huang Wang is the founder of Huami and has served as the chairman of Huami’s board of directors and as chief executive officer since its inception. Wang is a serial entrepreneur with significant experience and expertise in the technology and Internet sectors in China. He founded Anhui Huami in December 2013 to develop, manufacture, and sell smart wearable devices. Prior to that, Wang founded Hefei Huaheng Electronic Technology Co., Ltd., a company that developed tablets and tablet-based mobile apps and provided e-magazine network services, and led the team that released China’s first tablet. In 2002, he founded Hefei Huakai Yuanheng Information Technology Co., Ltd., a company that developed embedded Linux software and hardware. Wang previously was a research and development engineer at Huawei Technologies Co. Ltd., a leading global information and communications technology solutions provider, where he played an instrumental role in the development of high-speed switching and routing equipment. He has received many honors in the business world as well. To name a few, he was awarded “Anhui Economic Person of the Year 2015”, “Leading Talents of Strategic Emerging Industry Technology in Anhui”, and “Hefei Youth Entrepreneurship”. Wang received his bachelor’s degree in applied physics from the University of Science and Technology of China in 1997. With Huami recognized as the top wearable device company in the world ahead of Apple and Fitbit and with over 50 million units sold, Huang Wang will share with us what he sees for the future of wearables and how he views the connection of human emotions to an unfeeling matter, the internet, at TechCrunch Shenzhen 2018. Alvin Graylin is the President of HTC China, leading all aspects of the Vive/VR (VIVE.com) and the smartphone business in the region. He is also currently Vice-Chairman of the Industry of Virtual Reality Alliance (IVRA.com) with 300+ company members, President of the $18 billion Virtual Reality Venture Capital Alliance (VRVCA.com), and oversees the Vive X VR Accelerators (VIVEX.co) in Beijing, Shenzhen, and Tel Aviv.VIVE is a first-of-its-kind virtual reality platform, built and optimized for room-scale VR and true-to-life interactions. Delivering on the promise of VR with game-changing technology and best-in-class content, VIVE has created the strongest ecosystem for VR hardware and software, bringing VR to consumers, developers, and enterprises alike. The VIVE ecosystem is built around the best VR hardware in market, supported by VIVE X, a $100 million accelerator for VR and related technology startups, Viveport, a global platform and app store with the world’s first VR subscription model that operates in more than 60 countries, and VIVE Studios, its VR content development and publishing initiative. 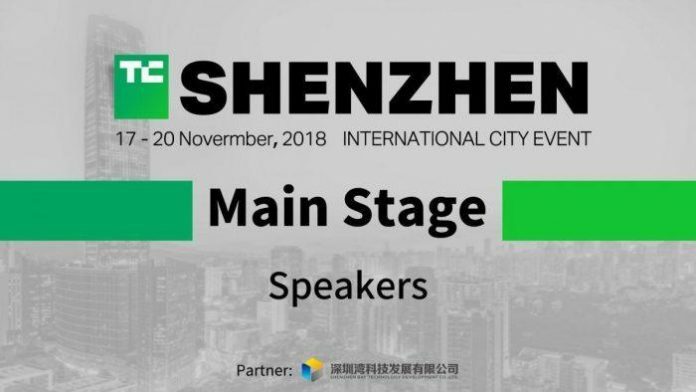 At TechCrunch Shenzhen 2018, Alvin Graylin will talk about how the “VR Year” has become a “VR Winter” and how VR should overcome such roadblock. Responsible for all of HTC’s blockchain programs, Chen Xinsheng’s new title is also known as the “decentralized CEO.” HTC is the latest company to join the blockchain market. In the first half of this year, HTC announced plans to launch a new blockchain-driven Android phone, the Exodus, with universal wallet and hardware support for its cryptocurrency and decentralized applications.At TechCrunch Shenzhen 2018, Chen Xinsheng will talk about the search for the “next generation” of smartphones. Eric Pan, founder and CEO of Seeed Studio, life-long maker and biker. He is trained as EE with projects about Electronics, Embedded System, Robotics. After graduation, he worked in Intel as chipsets product engineer on quality control and NPI, then took various job including international trading and sourcing. He established Seeed Studio since 2008, providing open hardware modules and service to help makers turn ideas into products. He also created Chaihuo x.factory in Shenzhen, and introduced the first Mini Maker Faire to China. With all the works done to accelerate small-scale hardware innovators, he has been selected as cover page by Forbes China as 30 young entrepreneurs under 30. Seeed Studio is an IoT hardware enabler providing services that empower makers to realize their projects and products. By partnering with technology providers from hardware to the cloud, Seeed Studio offers a wide array of hardware platforms and sensor modules ready to be integrated with existing IoT platforms. With Shenzhen’s extensive and flexible supply chain, Seeed Studio also offers customization and agile manufacturing services, ranging from a single unit to over 10,000 units. Seeed Studio serves the global market from its headquarter in Shenzhen, China, with branch offices in the US and Japan.